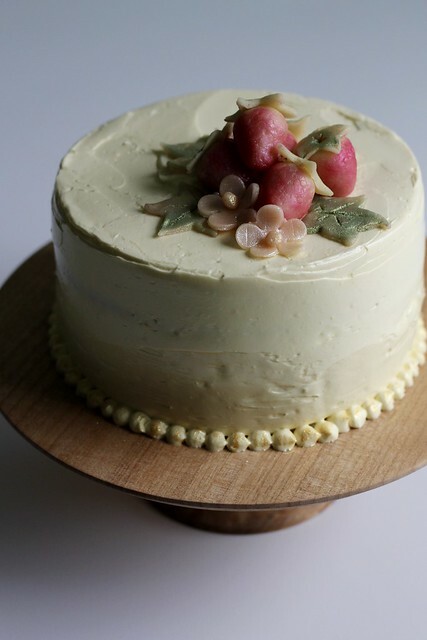 So, ten years ago at the start of January, my buddy Laurie started Tuesdays with Dorie to bake her way through the copy of Dorie Greenspan’s Baking: From My Home to Yours that she’d just received for Christmas. What could have been a perfectly fun solo project turned into an even more fun international group bake-along. I have no idea anymore how I first heard about the group (except to say that the food blogging world was much smaller ten years ago), but I jumped on immediately and over the course of several years baked (and took many blurry photos of) every recipe in BFMHTY. Well almost…the very first recipe that Laurie chose to tackle from the book, the Brown Sugar-Pecan Shortbread Cookies, went unmade by me. And since I was so very close to book completion, it had been nagging at me ever since I put BFMHTY back on the shelf and moved on to BWJ, BCM and DC. It may take enduring ten years of vague, low-level guilt for me to get around to doing something, but here those cookies are. 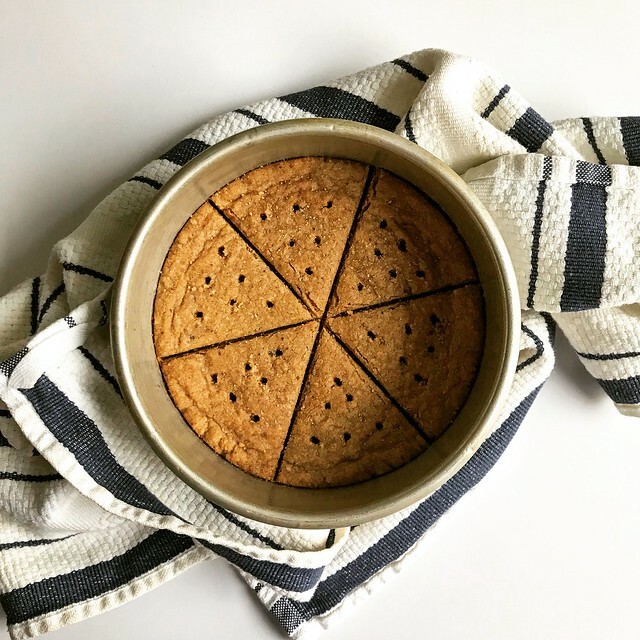 I made a quarter recipe and instead of rolling the dough and cutting it into squares, I patted it out into a six-inch cake pan lined with parchment. Then I cut my round into wedges while it was still hot with a bench scraper. These are nice and sandy, a little nutty and a little caramely. Book done, guilt gone and cookies on the counter. All’s well. 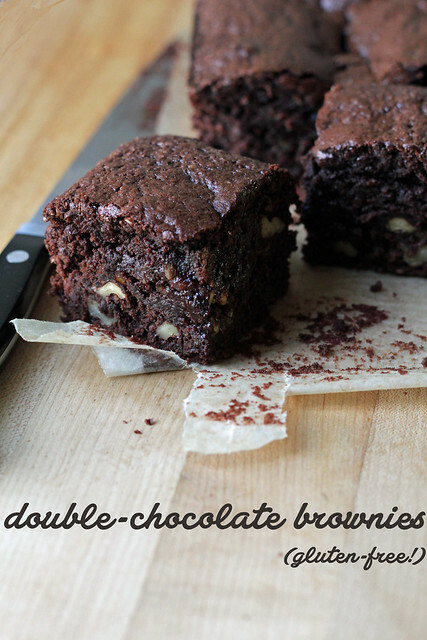 For the recipe, see Baking: From My Home to Yours by Dorie Greenspan or find it here. Concord grapes are one of the highlights of fall in the Northeast. Every autumn, I’m sure to make a pie and a batch of jam from them. Thinking about what else I could do with the purple-blue beauties, a crumble seemed like the next logical experiment. 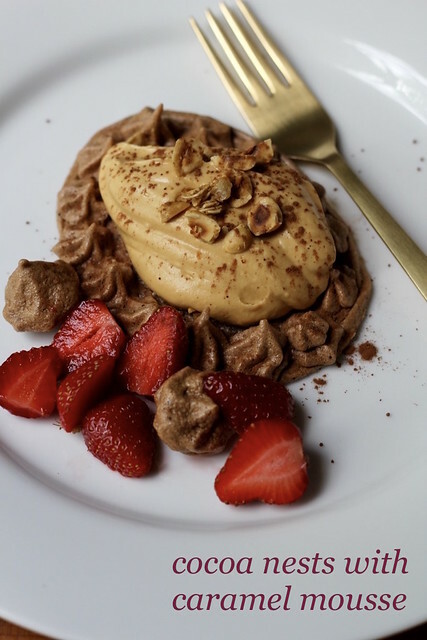 A peanut butter crumble, of course. I prepped the fruit for the crumble in much the same way I do when I make the pie. It sounds a bit tedious to seed the grapes one-by-one, but it’s only about a quart of grapes, so it doesn’t take too long. It’s one of those zone-out prep tasks that’s really worth the step. After a stint in the oven, the fruit bakes up jammy and deeply purple and the crumble topping tastes like peanut butter cookies. This one’s definitely added to the annual list. 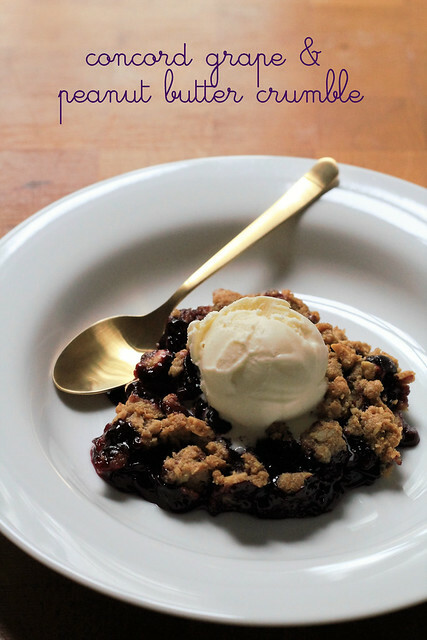 Steph’s Notes: You can mess around with this crumble topping a bit if you want or need to. For instance, you can sub AP flour for the whole wheat or chunky PB for smooth. And if you don’t have peanut butter powder, just leave it out. -Start by making the crumb topping. Combine all dry ingredients for the topping in a medium bowl, then stir in the peanut butter and the melted butter. It will resemble a soft peanut butter cookie dough, but after chilling briefly, you’ll be able to break it into clumps. Put the topping in the fridge while you preheat the oven to 350°F and prepare the fruit filling. -For the filling, slice grapes in half and remove the seeds. As you work, put the seeded grapes (and their skins, which tend to easily slip off–don’t worry about it) into a large sieve set over a medium bowl. Drain off grape liquid, saving 2 tablespoons. -Whisk the sugar, cornstarch and salt in another medium bowl to blend. Mix in drained grapes, reserved juice and squeeze of lemon juice. -Put the fruit mixture in the bottom of a greased ceramic or glass baking pan, approximately 8-9″ in diameter. -Sprinkle the chilled topping evenly over the fruit mixture, breaking it up into clumps and crumbles. Bake until topping turns golden and juices are bubbling, about 35-40 minutes, turning at the halfway point. -Let cool on a wire rack at least 30 minutes before serving. Over the years, I must have seen the Baking with Julia TV episode where Marcel Desaulniers makes his White Chocolate Patty Cake a dozen times. Normally, white chocolate doesn’t really float my boat, but for some reason, I could tell by watching the episode that this cake would be fabulous. I’m so glad that we’ve finally gotten to this recipe– and that my decade-long cake daydreams came true! 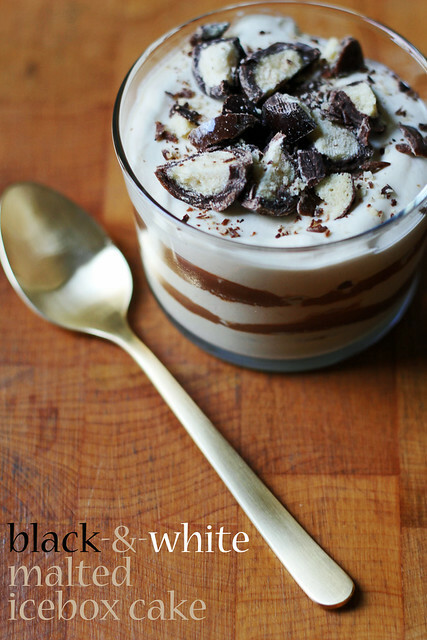 The white chocolate here is melted into the cake batter– a whole 12 ounces of it. 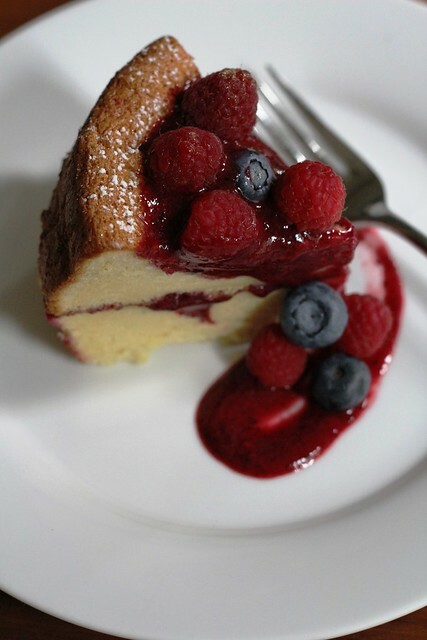 Two layers of cake are dressed up with raspberry sauce (made from pureed frozen berries) and fresh raspberries. I made this with the Fourth of July in mind, so I used a combo of blueberries and raspberries in the sauce and on top. You know, for that whole red, white and blue effect. I think blackberries would shine in this cake as well. In addition to all that white chocolate, the cake also has lots of eggs, so the texture is luxe and velvety. Snappy berry sauce keeps it from being to sweet. The cake rises in the oven and then shrinks a bit as it cools. If you make the recipe (which you should! ), you might be concerned that the layers look a little schlumpy. Don’t worry because once it’s stacked and decorated with the sauce and berries, it looks like a million bucks. The cake will slice neater after it’s been refrigerated for a bit and the sauce has time to firm up. For the recipe, see Baking with Julia by Dorie Greenspan (there’s a a video here of Chef Marcel making the cake with Julia). Don’t forget to check out the rest of the TWD Blogroll! Markus Farbinger’s take on Cardinal Slice is the first I’d heard of this cake. Where have I been? On the wrong side of the Atlantic, I guess. It’s called kardinalschnitte in Austria, where it’s a classic (and apparently ubiquitous— ha!) Viennese pastry. Well, I didn’t need first-hand experience to know that I’d like to sink a fork into a cake made of ladyfingers and meringues sandwiched with coffee whipped cream. If I could successfully pull it off, that is. When was poking around the interwebs for info on the Cardinal Slice, I came across Joe Pastry’s detailed posts on the subject. Seems that in order to recreate a classic version, he started off with the BWJ one and then scrapped it for another because he couldn’t make it work. Oh no– not promising! The cake layers are alternating strips of meringue and ladyfinger batters baked side-by-side…two things that require very different baking times and temperatures. The BWJ recipe bakes for a long time at a low temp, which cooks the meringue, but makes getting a puffed up ladyfinger tricky (I can only assume that Chef Markus has made this so many times in life that he just has the touch). I didn’t want to abandon the BWJ recipe entirely here, so I decided to follow the BWJ ingredients and mixing techniques with the baking temperatures Joe Pastry recommends (essentially to start out in a hotter oven and then reduce the temperature halfway through). I don’t think that my cake layers came out as poofy as either Markus’s or Joe’s, but my mixed up method seemed to work out OK. The Cardinal Slice has a bit of a tiramsu thing going on with the flavors, but since the filling’s all cream with no yolks or mascarpone, it feels a lot lighter. Like any other type of icebox cake, the cake layers soften further as the cream absorbs into them, and this needs about an hour’s rest before cutting into it. I’d say the recipe instructions to eat the cake within four hours of assembly are probably ideal, although we did have a hunk left over that we ate the next day. It was very smooshy at that point, but still tasty. 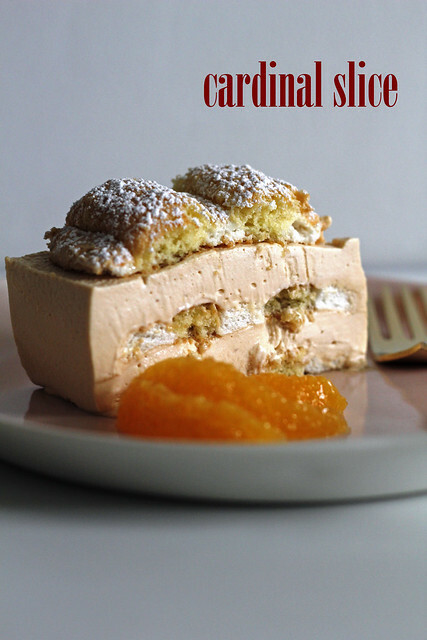 For the recipe, see Baking with Julia by Dorie Greenspan (there’s a a video here of Chef Markus making the cake). Don’t forget to check out the rest of the TWD Blogroll! This Crème Bruléed Chocolate Bundt is the first, no second, no make that third Mary Bergin chiffon cake we’ve made. 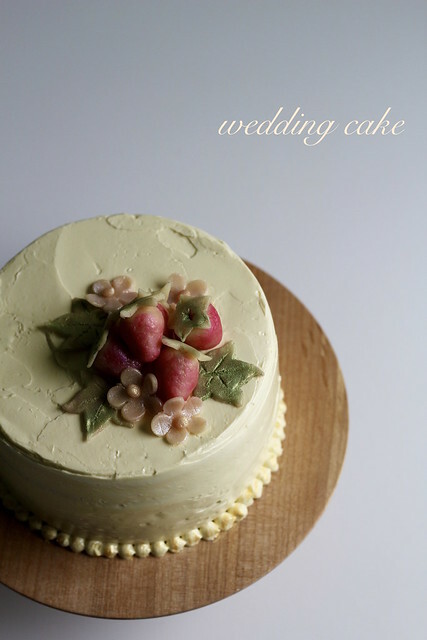 I’ve liked them all…I think I just really like the spongy, fluffy softness of chiffon cakes. 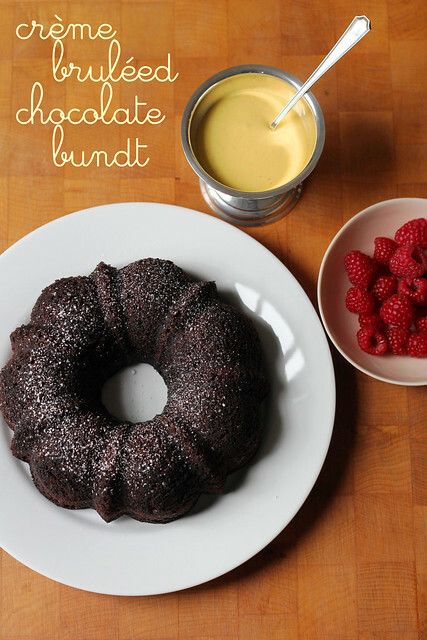 And it also helps here that I love chocolate and Bundts. And crème brulée, too…who am I kidding? I knew this would be good. 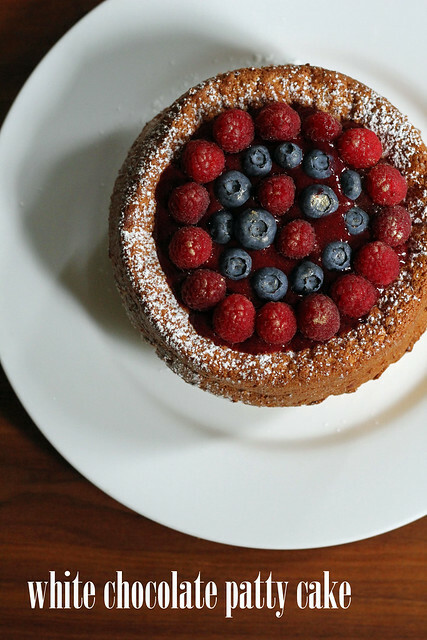 If you watch the video of the BWJ episode, you’ll see that this chocolate chiffon Bundt gets its center stuffed with raspberries and then a big glug of vanilla crème brulée custard is poured over top of the whole shebang and torched. I figured that as soon as the brulée was poured on, the cake pretty much needed to be eaten up…This would be very dramatic and impressive for a crowd, but since I was just making it for two of us, I had to both reduce the recipe and settle for adding the custard to order. I made a half recipe of the cake (in my 6-cup Bundt pan) and a half recipe of the brulée cream, too. I was convinced, even though I’d sprayed the heck out of my Bundt pan and coated it well in cocoa (which I prefer to use instead of flour for a dark chocolate cake), that the cake would stick like crazy and rip when I tried to unmold it. It didn’t! I made sure to kind of gently nudge it from the sides with a little offset as it started to cool and shrink in a bit, and it released perfectly– phew! 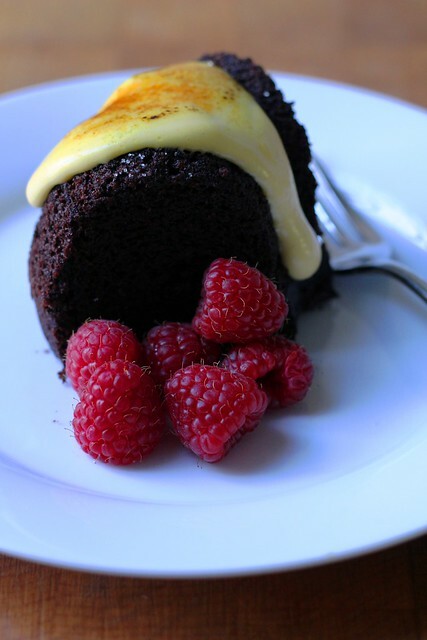 I used my darkest cocoa powder (Valrhona) and my Bundt had great flavor. The chiffon was easy to make, too…in fact, I did the whole thing in my bathrobe (TMI??). I’d happily make it again on its own, just to have with ice cream or whipped cream. I liked the stovetop water bath method for thickening the crème brulée…that was new to me, and it came out nicely. After the better part of a day in the fridge, the brulée had thickened up well and I was able to pour it over a single slice without it looking a mess. 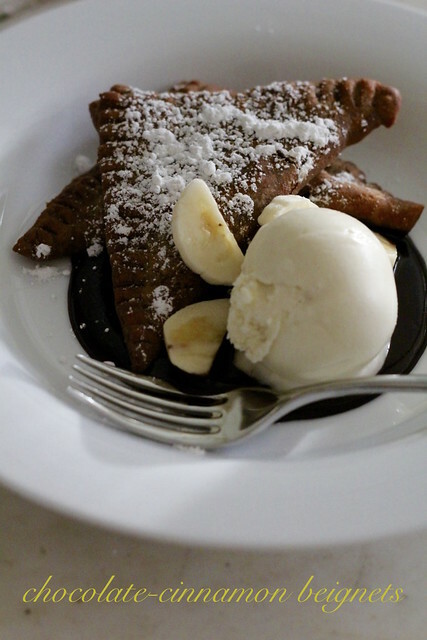 All in all a winning dessert for Valentine’s Day weekend.